This museum, Bogor Perjuangan Museum contains relics from the war in the Bogor Karesidenan, includes Cianjur, Sukabumi, Depok and Bogor. The museum’s recorded many battles such as Bojongkokosan, Jambudipa, City of Paris, Cemplang, Maseng, even the famous Captain Tubagus Muslihat and variety of weapons, clothes that have been used by fighters (still covered with blood), diorama of the battles, as well as a number of newspapers during the war. The building that used as a museum, formerly owned by a Dutch businessman named Wilhelm Gustaf Wissner. Built in 1879 which was originally used as a warehouse before the export of agricultural commodities shipped to countries in Europe. During the battle, the building was used as a place of young generations’ activities under the banner of the Indonesian Scout. 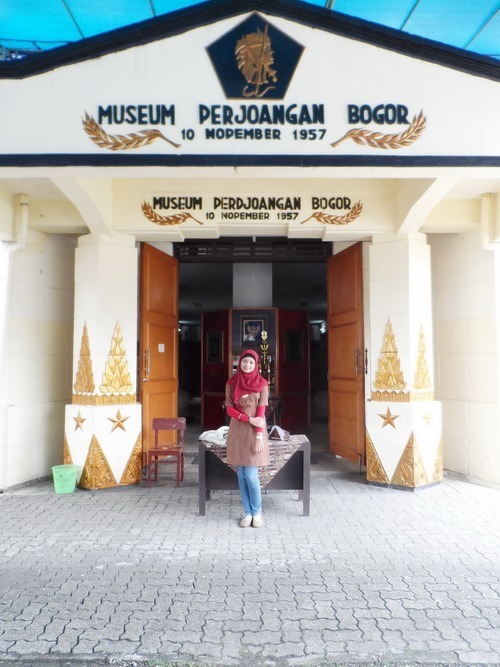 Over half a century old, Bogor Perjuangan Museum which is located on Merdeka street, Bogor City almost forgotten by people. Let alone on a normal day, the holiday season was empty from visitors. There’s no guide that accompanies visitors expected to be one of the causes of the lazyness for people to come to the museum. In fact, a number of Malaysian citizens who visited the museum a few years ago was criticizing about how bad the treatment of Indonesian to their own relics history. With salary only Rp.200.000 for a worker per month, It’s impossible to develop the quality of the museum. How can they find out moonlighting for extra income?. In our opinion, the Bogor Perjuangan Museum are not deserve to be in the current place. Because of its location in the nearby mall, the traffic jam around at that place, we think that it is not feasible for such a museum. However, It’s different nowadays. Since 2010, the museum opened on 10 November 1957 has finally improved the management slowly but sure. In fact, the City Government through the Department of Education Bogor also requires each school to visit this museum as a place of learning. As a result, almost every day, especially during the holiday season, the museum contains relics history from 1945 to 1950 in the area of Bogor Karesidenan are visited by students from kindergarten to college students. The number of visitors are up to hundreds of people per day. So, for those who like or want to explore the history of the history of wars in the Bogor, West Java in particular and in general, there is no harm to come visit. In order to understanding a knowledge of the history of national wars, which of course will have a positive impact on us, which is increasingly adding to the spirit of our love to the homeland and the nation, as well as increasingly appreciating the value of struggles and sacrifices that have been done by the young fighters, our predecessors in order to win and maintain the Independence and Sovereignty of our beloved Republic of Indonesia. The museum is open every day starting at 08.00 am until 14:00 pm. On Monday to Thursday and Saturday to Sunday the price of admission Rp.2000. Come and may It would be useful for your knowledge of our nation’s history as well as the development of world history education in general.